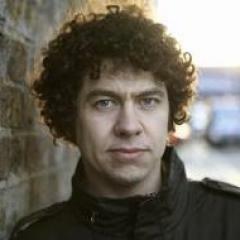 DECLAN O’ROURKE TO PERFORM SELF-PENNED MATERIAL AT GALLIPOLI 100 CONCERT IN KELLS, ON 25 APRIL. 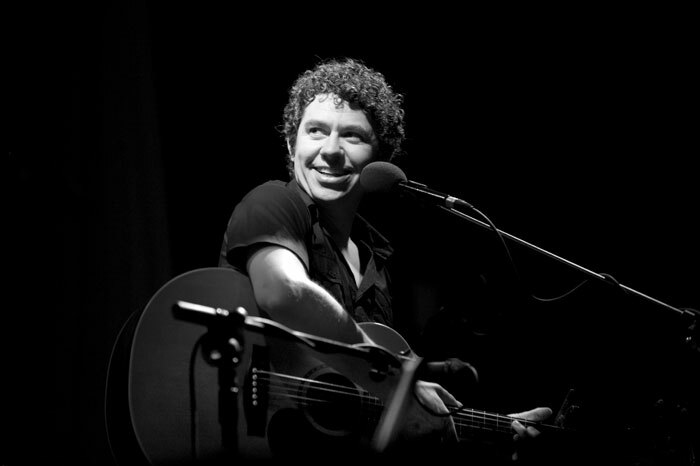 The Hay/Kells Festival and RTE Radio 1’s The History Show – co-sponsors of Gallipoli100 – are pleased to announce that singer-songwriter Declan O’Rourke will be performing new material on the subject of the Great War at his Gallipoli100 concert in St.Columba’s Church of Ireland in Kells, Co. Meath on Saturday 25 April. Declan’s evening concert (which kicks off at 8.00 pm) will be the centerpiece of a weekend of events to mark the centenary of the start of the Gallipoli campaign – one of the most tragic episodes of the Great War, particularly from an Irish point of view. Declan, who was a special guest in one of the five History Show Great War commemorative programmes in the summer of 2014 will perform some of the iconic anti-war works of Eric Bogle as well as a new version of The Foggy Dew and his own unique interpretation of Cormac McConnell’s epic song on the Christmas 1914 truce on the Western Front – as well as much additional material – as part of the evening event Poems of War, Songs of Peace. A number of WW1 poems will be read by Kells-based award-winning Welsh poet Nerys Williams. If I told you that an Irish Prime Minister was born in 1839 you would doubtless respond, correctly, by pointing out that a) we don’t have a Prime Minister we have a Taoiseach and b) that anyone born in Ireland in 1839 would have spent his entire working life as a citizen of the United Kingdom of Great Britain and Ireland of which there nearest thing to an Irish Prime Minister was the Duke of Wellington in the early 19th century. Except, of course, that John Balance, born in Co.Antrim in 1839 went on to become 14th Prime Minister of New Zealand. Born into farming stock Balance wanted to do anything but farm and left for Belfast at the age of 18. From there he migrated to Britain, working in the ironmongery business in Birmingham. At the age of 24 he married Miss Frances Taylor and migrated to New Zealand in 1866 for the betterment of her health. The move had little effect as, tragically, she died two years later. An educated and bookish man he indulged his literary side by establishing a newspaper, the Herald, in the town of Wanganui, where the couple settled. He was man of independent views. For example, while participating in a military campaign in 1867 against a local Maori uprising he criticized the conduct of the same campaign in his newspaper. From campaigning journalism he moved inexorably into politics – elected for Wanganui from 1879 as an Independent he quickly entered the New Zealand cabinet as Minister for Customs and then Minister for Education. Balance had witnessed religious riots in Belfast. The spectacle turned him into a life-long secularist. He inherited his politics from his mother, a Quaker, and went on to found the New Zealand Liberal party – the first organized political party in that country. In 1881 he lost his seat by four votes after a carriage containing 7 of his supporters broke down and they were unable to vote. Re-elected in 1884 he held three further ministerial positions until the government he supported fell. 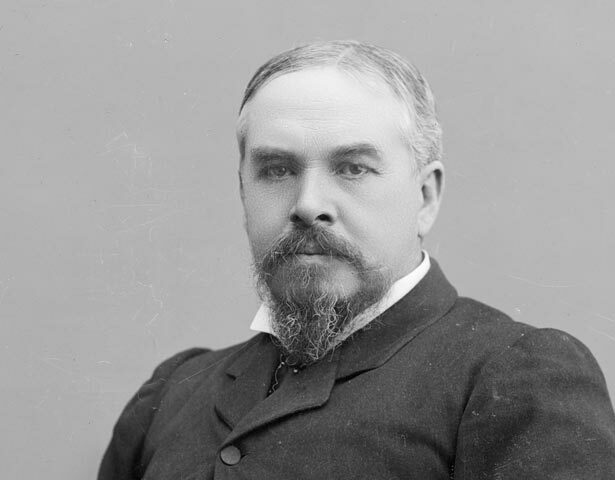 In 1889 he became leader of the opposition and in 1890, after a successful election campaign he became Prime Minister at the head of a Liberal Party government. Ballance was responsible for introducing highly progressive systems of income and property tax and under his leadership the New Zealand economy expanded. He also cultivated good relations with the country’s Maori population, settling a lot of their nagging land issues. 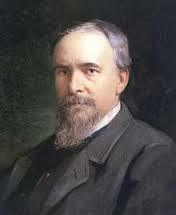 He was also responsible for the introduction of female suffrage. New Zealand was the first country in the world to allow women to vote. He was at the height of his powers and popularity in 1893 when, tragically, he died after an operation for an intestinal ailment at the age of 54. Balance has been described as ‘unassuming and unpretentious’ in style and personality, quiet, polite, tolerant and patient. How he ended up as a politician, therefore, is a complete mystery. John Balance, the Antrim-born 14th Prime Minister of New Zealand, was born, 176 years ago, on this day. They used to boast that they had ‘more stars than there are in the heavens’ though their official motto was the lofty ‘Ars gratia artis’ – which translates from bog Latin as ‘art for art’s sake’. Their first mascot was re-named Slats and was succeeded by, among others, Jackie, Tanner, George and Leo. The boastful organisation told not a word of a lie – MGM in the 1930s and 40s had some of the biggest names in Hollywood under contract, stars like Clark Gable, Joan Crawford, Greta Garbo, Judy Garland, Gene Kelly, Fred Astaire – need I go on? As regards the motto, don’t believe a word of it – it was art all right, but it was purely for the sake of money. The logo was a different matter entirely. 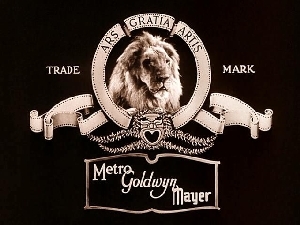 When Samuel Goldwyn’s old studio, Goldwyn Pictures merged with the exhibition business Metro and Louis B. Mayer pictures in 1924, the company had already started using a lion in their pre-credit sequence. MGM decided to continue the practice and the first occasion on which the MGM lion appeared before one of the studio’s movies was in the utterly forgettable and accordingly utterly forgotten He who gets slapped a silent movie starring Lon Chaney and Norma Shearer. Perhaps it’s a 1920s version of Fifty shades of grey who knows. And what has all this got to do with us, I hear you say? Well, its because of the identity of the very first MGM lion. The studio called him Slats but that wasn’t his real name. It was Cairbre. And he wasn’t African or even Californian, he was a genuine Dub. Cairbre was born in Dublin Zoo in 1919 and was named after Cuchulainn’s charioteer, or a High King of Ireland, or a rebellious pretender to the High Kingship, or whatever you’re having yourself. Cairbre had, apparently, been introduced to Sam Goldwyn, and the silver screen, by fellow Dub, Cedric Gibbons, the designer and art director. This means that Gibbons is personally responsible for two enduring Hollywood icons, neither of them human. He also designed the statuette to be presented to members of the Academy of Motion Picture Arts and Sciences at their annual award ceremony, we know them more familiarly today as, the Oscars. Gibbons apparently modelled the statuette on his wife, the statuesque film star Dolores del Rio. 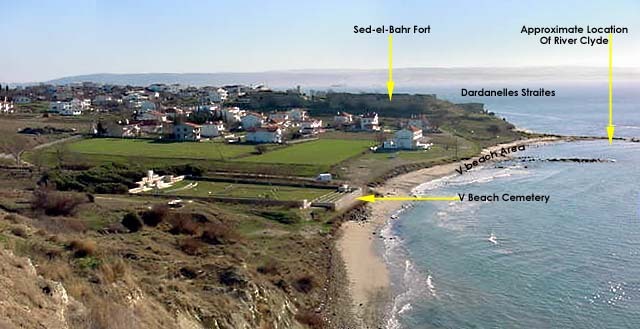 But back to Cairbre. 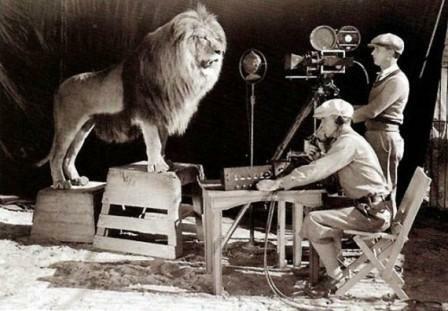 There is a famous photograph of two men filming him for the MGM logo. Health and Safety considerations don’t seem to have been paramount (no pun intended – though, ironically, that’s where the shoot took place – Paramount studios). Camera crew and big cat are separated, not by a hefty iron grille, but by a few feet of clear air. Were Cairbre of malevolent disposition he could have had a snack of cinematographer sushi any time he wanted. Cairbre’s image continued to be used on all the old black and white, silent MGM movies until 1928. As no one had recorded his heavily Dublin-accented roar, when the talkies began he was replaced by the more garrulous Jackie. He died at the age of 17 and although his hide is on display in a museum in Kansas he should not be confused with the cowardly lion of MGM’s The Wizard of Oz. When the comedian Mary Tyler Moore formed her own production company MTM in the 1960s – she mimicked the MGM logo, but replaced Cairbre with a little pussycat – it’s highly unlikely the kitty is also Irish. Cairbre, the big cat who tossed his mane from side to side for MGM, was born 96 years ago, on this day. 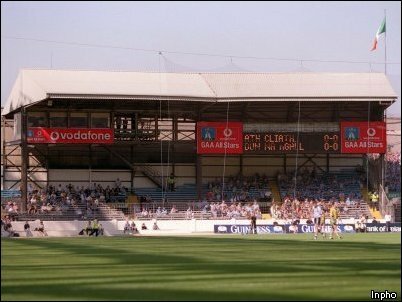 In September 2003 the redevelopment of Croke Park led to the demolition of the old Nally Stand and the creation of the Nally Terrace, adjacent to Hill 16. While people would be well aware that the stadium’s Hogan stand was called after the best known victim of the Black and Tans’ unwelcome visit to Croke Park in November 1920 on Bloody Sunday, and that the Cusack Stand was named in honour of one of the GAA founders, how many people would know the story behind the man for whom the old Nally Stand was dedicated in 1952? Patrick W.Nally, as you might expect, was one of the motive forces behind the creation of the GAA in 1884, though for reasons that will become clear, he was not present at the pivotal meeting in Thurles that established the new body. He was, himself, a well-known athlete who began discussions with Michael Cusack in the 1870s about forming an organisation devoted to the promotion of Gaelic Games. However, his motives were not entirely sporting in nature. 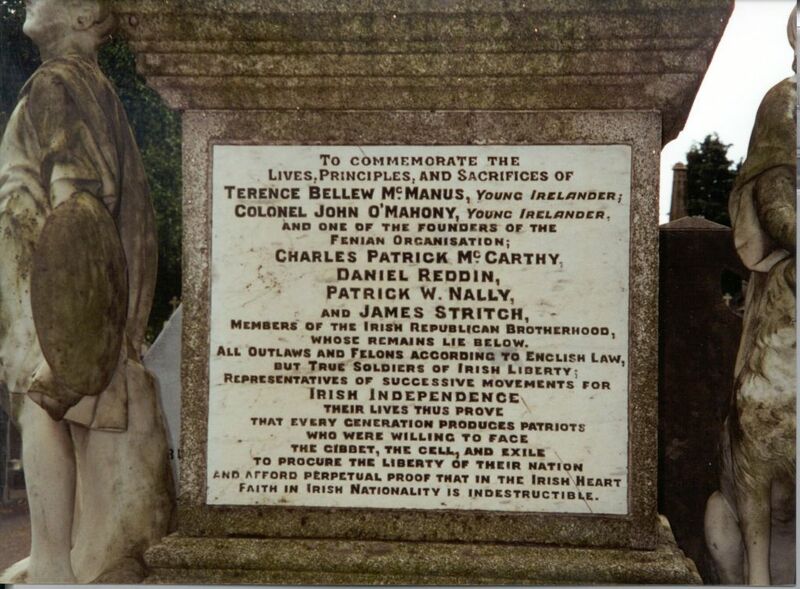 Nally was, at the time, a member of the Supreme Council of the revolutionary nationalist organisation the Irish Republican Brotherhood which he had joined in his early twenties. He managed to keep his republican activities – his job was to import firearms into Connaught – secret from the local Mayo RIC by condemning agrarian outrages. This was, somewhat surprisingly, perfectly consistent with IRB policy. So much so that when he applied for a gun licence the local RIC Inspector advised his superiors that it was safe to grant the request, asserting that Nally ‘would lead a useful and loyal life’. Indeed he did, but not quite in the way the senior policeman anticipated. 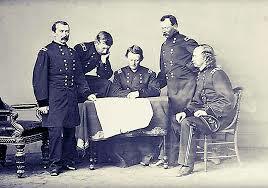 With the Land War raging in 1880, Nally’s IRB activities came to the attention of spymasters in Dublin Castle and London. To avoid arrest he left the country for two years, returning in 1882. He was arrested on conspiracy to murder charges the following year – this was a favoured Dublin Castle ploy for jailing people it didn’t much approve of. He was implicated by an informer, another common procedure at the time. Nally was convicted, and sentenced to ten years penal servitude. Half way through his sentence his father, W.R.Nally, sought assistance from an apparently unlikely source, Captain William O’Shea, husband of Katharine and later Parnell’s nemesis. However, O’Shea, though a conservative nationalist and a bona fide charlatan was a political opportunist with a history of murky associations with the IRB. O’Shea’s self-serving efforts to secure Nally’s early release came to nothing. He was pre-deceased by four weeks by the man he had refused to betray to secure his release. At his funeral the same green flag was draped over Nally’s coffin as had enveloped that of Parnell himself a month before. Patrick W.Nally, revolutionary nationalist and sportsman, was born 159 years ago, on this day. Was the man who is supposed to have uttered the decidedly non PC comment ‘the only good Indian I ever saw was a dead Indian’ born in Killinkere, Co.Cavan, in mid-Atlantic on the emigrant boat to the Americas, or in the USA itself. No one knows exactly, but no one totally trusts Phillip Sheridan’s own version, which is that he was a 100% American, born in Albany, New York. Sheridan first made a name for himself at Westpoint Military Academy where he was suspended for a year for fighting with a classmate whom he had threatened to run through with a bayonet. This type of behaviour was not encouraged by the authorities despite the fact that he was training for an occupation in which he would be required to kill people. His reputation was greatly enhanced in the American civil war where before his first major promotion – to Brigadier General – he was described by his divisional commander as being ‘worth his weight in gold’ as a cavalry officer. Later his pursuit of Robert E.Lee’s army in the final campaign of the conflict, forced the southern commander to seek surrender terms and end the war. Two years later Sheridan headed west to begin the work for which he would become famous, or notorious, depending on your point of view, defending the area between the Mississippi river and the Rocky Mountains from Native American nations like the Lakota and Cheyenne who had lived on the Great Plains for centuries before the arrival of the white man. His methods were utterly ruthless. Intent on corralling the Plains tribes in Federal reservations he encouraged white hunters to wipe out their main food supply, the buffalo. 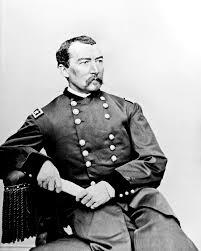 He was also General George Armstrong Custer’s boss – not that Custer was much of a one for following orders if they got in the way of glorious triumphs like the murder of a peaceful Lakota settlement on the Washita River in 1968, a massacre that took place on Sheridan’s watch. Given Custer’s periodic unruliness Sheridan might not have been all that traumatised when his egotistical subordinate came to a bad end at the hands of the Lakota and Cheyenne in 1876 at the Little Big Horn. By the way – he may never actually have said ‘the only good Indian I ever saw was a dead Indian’. As a young man he is even reported to have had a child by a Native American woman with whom he had a lengthy relationship. But he probably did say something approximating the most memorable statement attributed to him. However, he always denied having uttered that telling phrase.